so, leaving the last job because they shut sown production, i walked out the door with a nice heavy duty router, accessories and routing table platform. now i have almost everything i need, but enuff to do scratch builds. 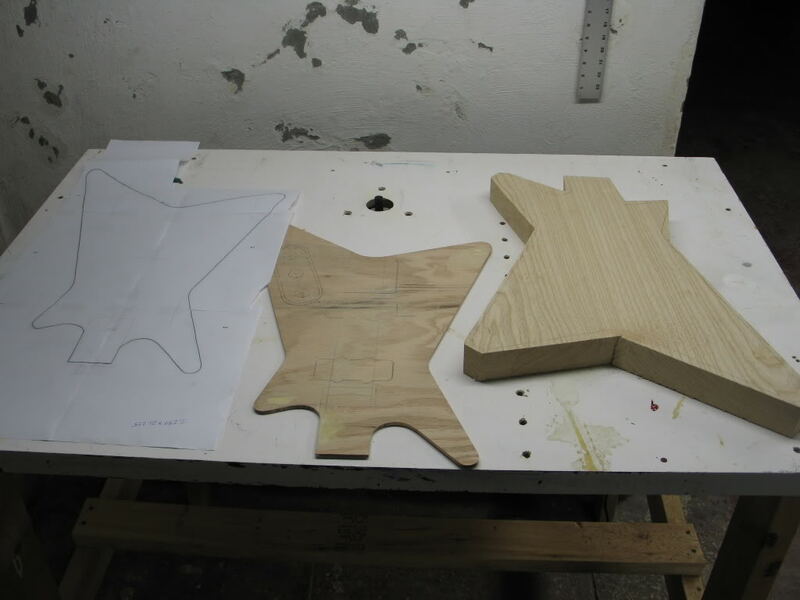 i am still far away from being a "luthier". i still have a lot to learn. i remember when i was 16 and looking for my first bass. 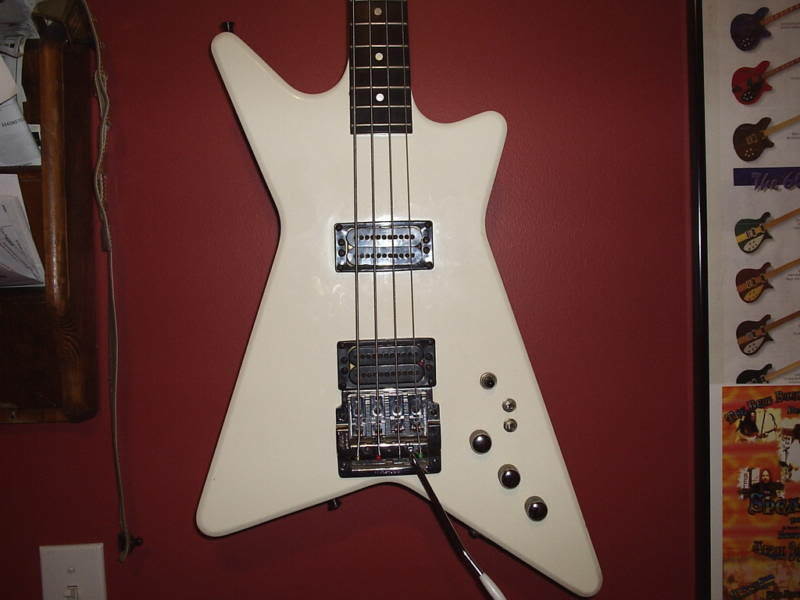 i really wanted a carvin v440 (with a trem), but the list price was $700. since i was dependent on a birthday gift from my kemudgen old father, i ended up getting a no name brand POS, that i learned on and served its purpose. later in life i still wanted the v440 but it got discontinued and sparse and any of the ones i found for sale were beat to crap and still around $700. i saw one on ebay a few months back and it had "burn damage" for $300 ... it was very toasted. you guys know i'm determined. so my wife is awesome and bought me a nice piece of swamp ash body blank for christmas .... so here i go. i designed it from pics i found on the internets in corel. i printed it out, transferred it, made a template and ruff cut the body with a coping saw. i had the warmoth neck from the p bass sitting in storage. 5 years of gigging took its toll on this thing so its ready for a refin. 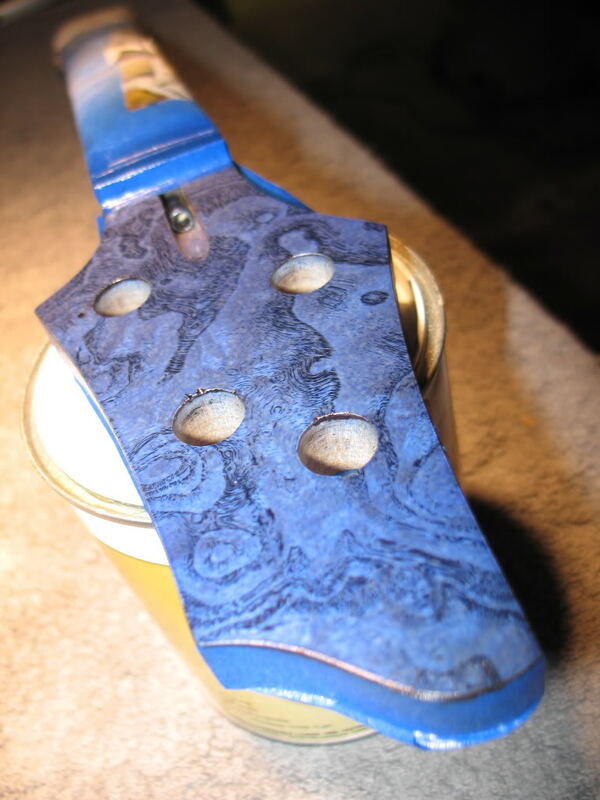 the headstock face was beat so i laminated it with ash burl. 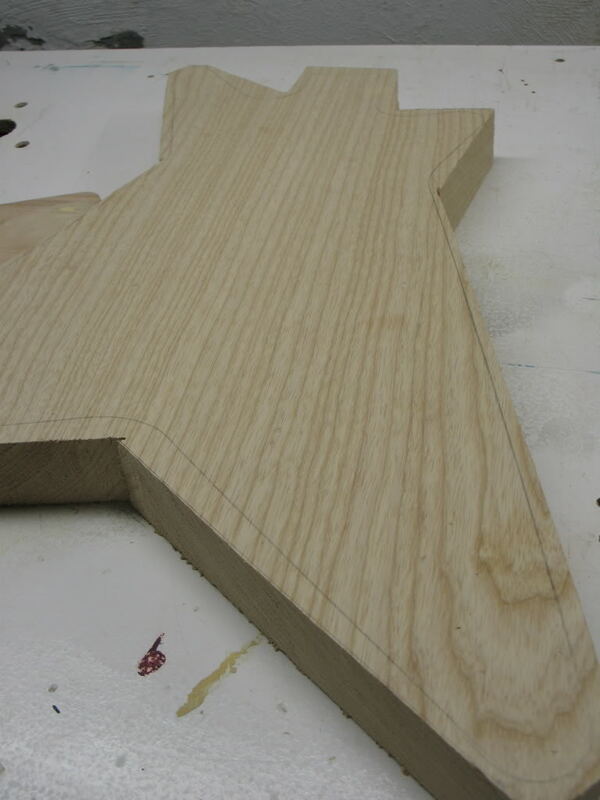 i cranked up the router and did the shape. it came out real well. this was all 2 days of work. so, last night i routed out the piece of wood for the electronics cavity cover and the cavity ... not much to take pictures of there. i will keep posting to keep you guys up to date. now if that was a LEFTY??????........well. j/k you know me and my pointy fetish. so long story short, this unit has been on my radar since 2002. in 2008 I saw a kid who got it from his uncle, wouldn't sell it still has it....ok fine. so on TB someone saw my old *** posts and wanted to know if I still wanted one? 400 shipped and he sent me an album of pics as well as some extra detailed shots of places I wanted to see. I shouldn't do it, but I will be playing 3 gigs this month and will have the money back from them for sure to pay for it. If you really wanted something like that, and you could be patient, I could make a lefty body like that for you mike. All we need is a decent neck to start with (i cant make necks yet and cant do neck thru yet) and some decent straight on pics to make a vector from. we are gonna be very busy with shows this summer, i'll have some cash in a few months and give you the CMG as some of the cash needed if at that point you still want it. I emailed the Vincent site to find out if they kept track of serials because I would love for this one to be one of the ones he used. since it is a righty it will only be a basement player and a collectible anyway, but the TAK GB series always caught my fancy. Holy smokes. I cant find any info on that bass at all! some guy on TB emailed Takamine and they told him as we always thought it was a XB series not GB. 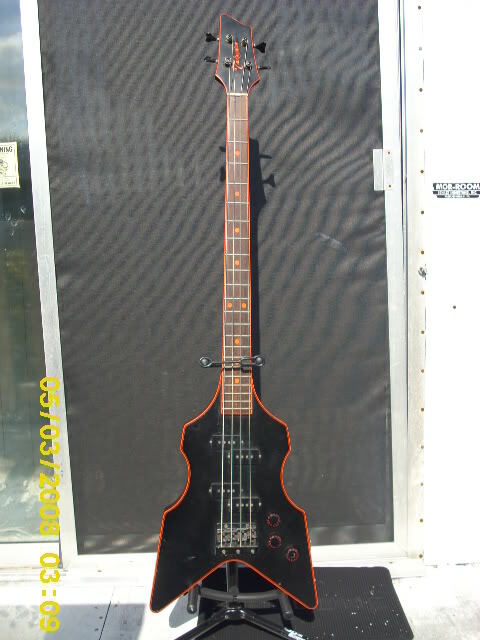 yeah, theres nothing overly complicated about that bass design at all (except the neck thru). we could definitely make a reasonable lefty bolt - on facsimile of that bass with some custom electronics (dimarzio, SD, barden, whatever) and a trem (theres plenty of room if not we're making room for it). that pic above is good enuff to work from. i'll start dilly dallying around with corel when i get some time. i just rolled thru ebay looking for necks. fender, fender, fender, fender, fender, fender, fender, fender, fender, fender, fender, i hate fender. somewhere like GPUSA and warmoth dont really have a pointey headstock design. you could always get a paddle and we can copy or design something. the thing with pointies is the standard block sizes are too small / short. i had to upsize my piece of ash for an additional $30. ... or, if you had a neck that you liked already ... thats just easier. we can always dye the fb ebony. inlay dots and trim / binding is a whole other trip. dots arent a problem as long as we could find some material. binding is a PIA. masking and shooting lacquer would be the way to go around the body. im pretty positive that red is painted on.... well like I said a few months ago, summer will be upon us in a few months and your next project will hopefully be mine. Its gonna have 6 strings. Wanna learn more guitar. I want an sg. MadMike, AWESOME job on your V440 knock-off! In fact, I'd be willing to bet that what you are building will be superior to what Carvin made. I well remember back the day when the V440's first came out, and how excited I was that a major company was producing a tremmed bass from the factory. But I, like you, couldn't justify the cost. One point I want to clarify. As you pointed out, I do glue the neck pockets of all of my basses. But this isn't so much about compensating for a sloppy neck route, but rather, it's more about providing more stability and sustain with my trem. On my old Yamaha BB300, I remember how dramatically the neck would bow backwards as I dropped the trem, and I freaked out a bit. At the same time, I have always heard that air pockets in a neck joint rob sustain, so I reasoned that the glue would take care of that. Now, there is some controversy over whether or not this makes a difference. I remember Darkstrike (Bill) insisting that gluing the neck pocket of a bolt-on wouldn't make one iota of a difference, and to be honest, I don't have a lot of hard data to support my theory. It's more of a comfort thing, I guess. Furreal, the way I did this pocket, even not bolted on, its press fit in there. I gotta wiggle it around for a few minutes to get it out of the pocket. Bolted on, this thing wont budge. I want to learn how to make necks next. I would much rather have a glue on tenision joint than a bolt on. 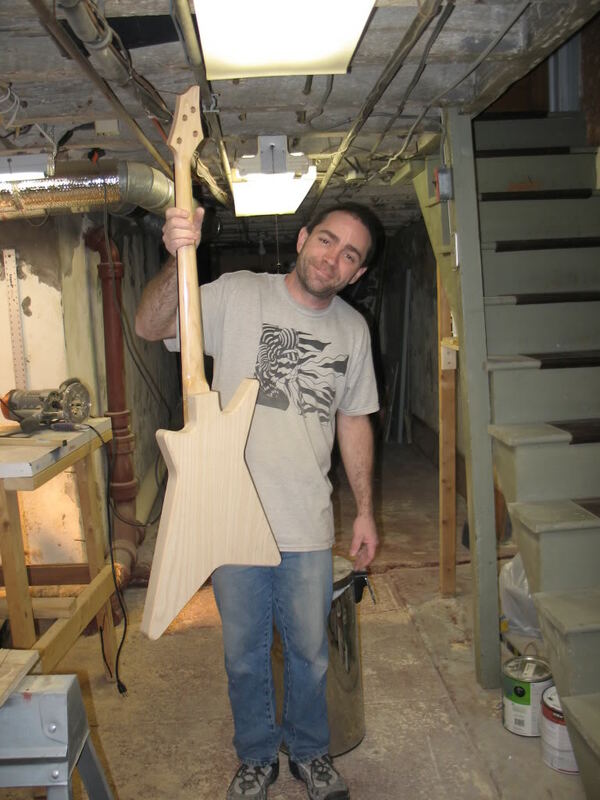 Bass is a little different than a guitar, but gibson has made ebOs that way for years. thanks Eric, when I get it I'll show some pics. I found a member of the Jackson forum that had the guitar version. Said it was a cheap trem, cheap pickups but did play and also said it was a set-neck not NT, so when I get this one I'll see if it is similar or truly a NT. I bought it for the novelty and since the band is doing good I had the cash not out of my bank account. Mike S will be busy this spring/summer with projects, I just hope he is not "that" busy to create something for me as well. your a "returning customer" mike ... you go to the top of the list (only behind me). when the time comes i'll send the CMG, and 2 lefty necks for the build....one of them should work. oh ... i can make any of them work. i'm cutting the body to fit the heel and scale of that neck. we'll use the best one. did you see the posts with the "linear trem"? would this tak be something your willing to try one of these on? its a thru body rout like a hipshot. i did see that and that looks interesting. Im trying to get more info on the thing. I did look into that .... like the jens ritter design, not for retail sale unless its on the bass. looking at the close up pictures of that red faux binding mike (it is paint). i dont know how they did this. in this close up picture you can see two things. i think that the bottom of the bevel to the side is the solid red painted band. the top of the bevel to the top of the instrument is that 1/32" double pinstripe. (!!!!!!!!! ) i dont know if i can reproduce that exactly. the other thing you can see in the same picture is the red wrapping around the side (where the dot markers would be) to the face of the edge of the fretboard and actually going underneath the frets. possible, but short of redoing the frets the option would be to not wrap around to the face ... or just shoot over top of the frets (along the edge) and clear lacquering the whole neck ... than dressing the frets (that i'll do anyway). the line around the fretboard and headstock dont match the pinstriping around the body .......??????? was just doing a vector mock up this morning and started noticing these details. remember too ... building this as a lefty from scratch ... we can do whatever we want beyond reason ... color, hardware, electronics, etc. i know, i know, i still havent found a good way to do a crackle finish. when i post the mock up i'll start a new thread. 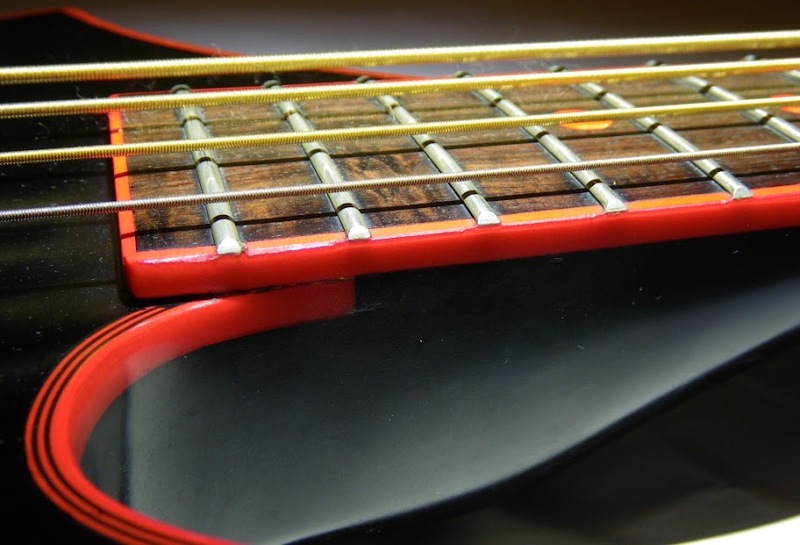 a black lefty "anything" with red paint binding would be "the bees knees"
That's why you are building the v440 body to get AWAY from everyone elses p-bass look. That's showing your age, Mike! Of course....the fact that I know that phrase myself only goes to show my age as well! so i am all about getting away from the standard p bass design, and the standards that have bassists pegged to one tone in every song, and that bassists dont solo, or use trems, etc, etc, etc. but i bring home the ironbird, and refinish it so it looks beautiful and what does wifey say? "it looks real 'loverboy'!" i think the pointies are a nostalgia thing and an attention thing. the 80's are way over and hitting the stage with a star, a bird or an explorer is just out of the ordinary and wild. i look at it differently. if entwistle can get on stage with a spyder or a buzzard in 78 and its cool (its entwistle, how could it not be?) then people like me and mike are doing the same thing ... NOT MIMICKING LOVERBOY. a single binding type red paint stripe is absolutely doable. i just see that parallel super thin dual red stripe parallel with the binding red stripe being an absolute nightmare and coming out really bad. i just dont have the right materials to mask such a stripe pattern that precise. LOVERBOY??? Is she serious?!? 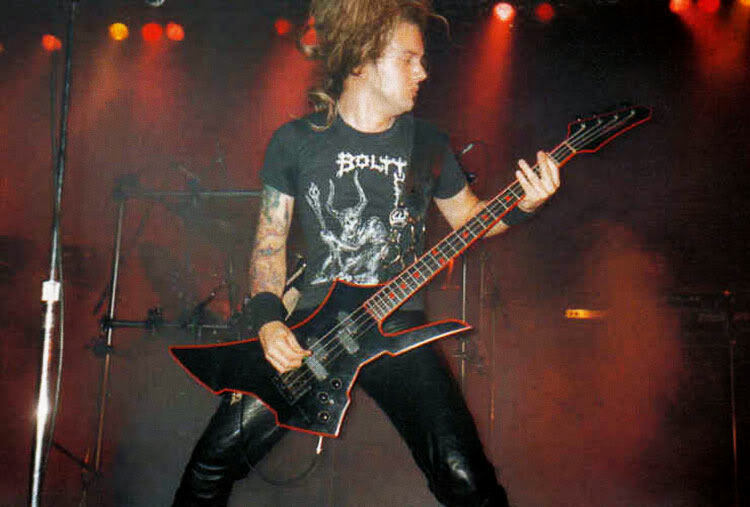 Scott Smith never even played an Ironbird or a V440! Must be the whole 80's vibe thing? i'm shocked that you even know the guys name eric. more than anything, i'de used the american accents products before and had varying results so i made a decision to just stay away from it. some color coats laid down fine with a good coat of clear lacquer over top, some, the lacquer clear would break it down and turn to old man skin and peel off. thats what happened to the first color coat i put on your series 10. i forget what i used next that did work. these are the reasons we come to places like this and ask a lot of questions. so i can find out why. this is an rustoleum american accents product that isnt an enamel or poly. it IS actually a nitro lacquer. when i looked at the msds and tds sheets, i didnt really know what i was looking for to tell me that it is compatible with lacquer clear coat (still really dont). it is lacquer so it definitely is. and its nitro lacquer so it is actually ideal for guitar finishing. i will do one like this for me in the future. not the steelers crackle ... but are you interested in any of these colors? 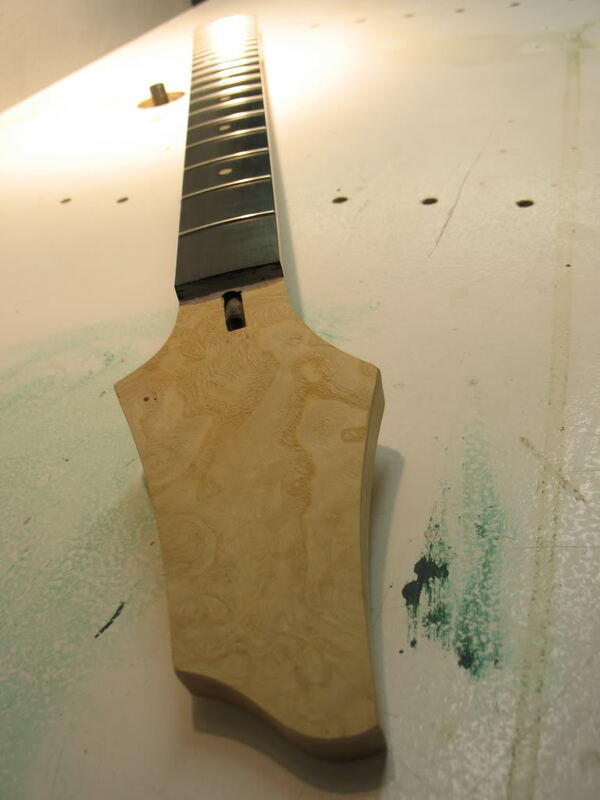 and heres one of the next "non p" designs i want to work on (because i cant afford a john paul jones alembic). To be honest, I had to Google it, since I could not remember it off the top of my head. But since I am a child of the 80's, I will admit that I have covered a couple of Loverboy tunes in my first few cover bands. Given the scene and the time, it was hardly avoidable. And also, you have to remember that Scott Smith was a Kahler user for a time. Granted, I have never heard any recordings of him using one, and I have yet to find any pictures of his tremmed bass, but I do remember him being listed on Kahler ad pages as a user. 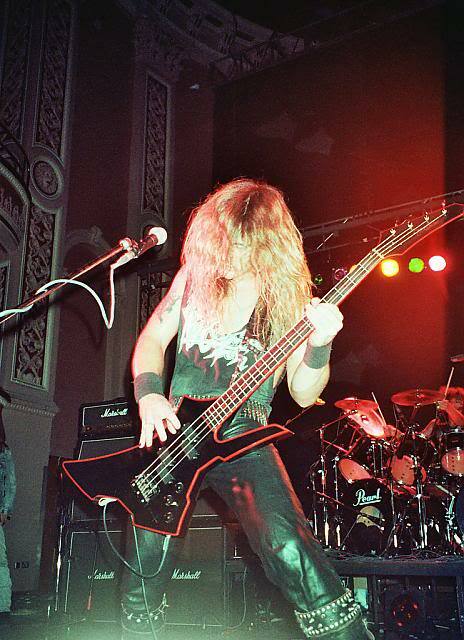 I don't think I've ever seen Scott Smith play anything other than either that Spector, Music Man, or whatever that headless he had was, not one had a Kahler. He probably just owned one and never really did anything with it with Loverboy. at least that kahler looks nice (see rant)! Ok, I got this kahler at a discount ($90), since it was damaged and bought another. Actually, taking a file to it, with a 3rd spring, ittl be fine, so I got 2 hybrids now. I put some hours in on this carvin today, setting up the neck and routing / installing the kahler. Its starting to look like a bass! 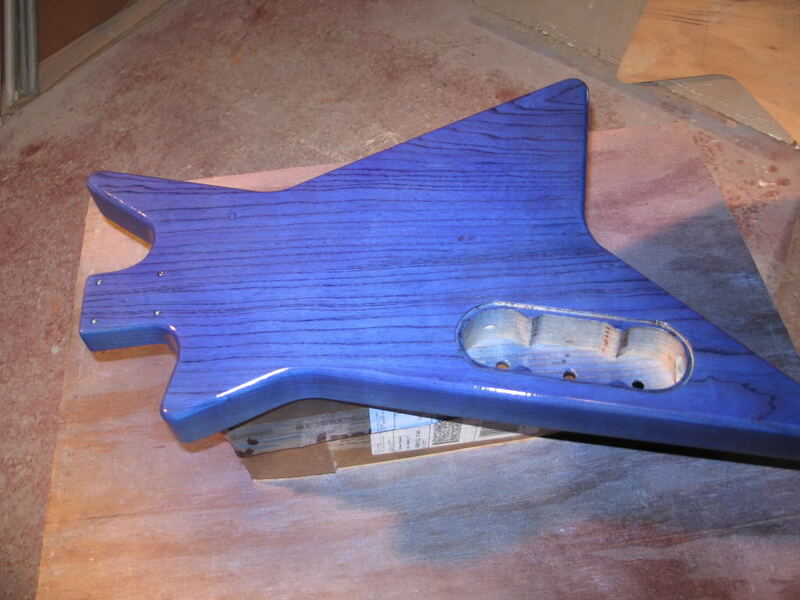 I gotta rout for pickups and 1/4 jack, install electronics, play it for a day or two, then im ready to spray the finish. I love the V440's my favorite Carvin & probabbly the most collectable / valuable one as well. Love the Sawmp ash & great job on the neck pocket. Reading that I see they offered them in Koa, never saw one. I wonder if they ever made any. The only ones I have seen are the ones in those ads - Black, Blue Metallic & White. i looked, as i wanted it to be as "carvin" as possible ... carvin doesnt make either models of those pickups anymore. i recently installed a carvin MM and loved the tone. i wanted to go with that, but i found guitar fetish MM pro pickups for like $30 cheaper. if they stink, then i can always replace them with the carvin MM's. short of going out and spending $200 on a pickup, i've had bad luck with single coils. i wish i could find the stock single pickups that came in my wasburn tarus somewhere ... this is by far the best sounding single coil bass i've ever had. 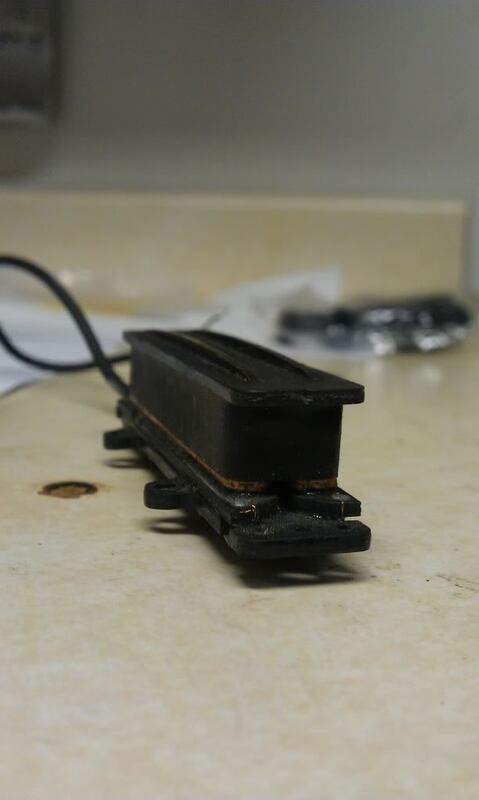 watch, they probably arent even singlecoils and they are stacked or reverse poll humbuckers or something like that. go find dualcoil J like my bardens? Always keeping my eye out for these. Expensive. I know. What a quality made pickup. how's the 440 copy coming along Mike? Never did a trans tint finish before. Always wanted to, tried, failed, and know a whole bunch more now. This body is swamp ash and an ideal candidate. Just wanted to do it following directions and not mess around with other finishing products because thats whats available. Oil based grain fillers are really difficult to find these days and I didnt want to mess with pore o pac or other water based filler. I ordered LMI's tinted grain filler and it took 16 days to get here. I didnt like the color so I tinted it darker with ebony. I really want the grain to stand out. Grain filled last night and started spraying today. Glad I waited for the right stuff ... the grain goes "BAM!". I should post pics in a week or so. I did a transparent finish on my Blueshawk. I used Dye, then clear. I had a couple of sand throughs that I had to touch up. Keep the extra dye if you do it. Another really cool effect with swamp ash is to dye the wood then back fill the grain with white or black paint or epoxy then sand back the fill color. now ... anyone remember when i was trying to do a finish like this on a p bass and it kept ending up green? i ended up just painting it solid blue. i know a little bit more about refinishing these days. Love it. Looks great. Nice ash! This stuff is very forgiving. Another coat will make it a tad darker but will make the spatters lay in and go flat. I gotta order another can tho.